More than ever, our working environments require us to always be at maximum performance and force us to stay connected. The possibility of disconnecting, even if only for a few minutes, becomes increasingly challenging. It is becoming imperative to find new ways to change our mindset, manage stress and find creative solutions to rebalance our quality of life at work. Today's challenge is to reflect on a transformation of the inner workings of corporate culture that will enable employees to be more fulfilled and motivated at work. This is the very concept of mindfulness: to activate one's full potential through mindfulness. Two Canadian companies, VIBRANT and InnoveLab, have created a card game that could reverse the trend. 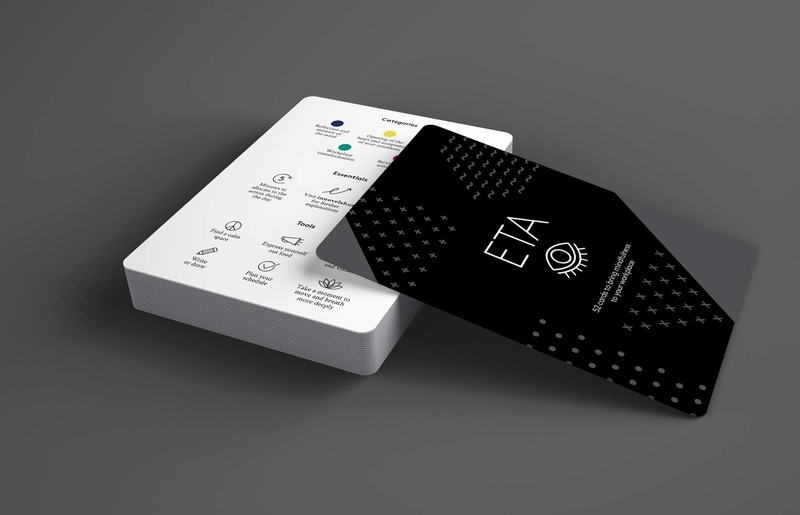 ETA is a 52-card game that will allow you to collectively move towards mindfulness at work. The principle is simple and effective: once a week, employees are asked to draw a card and set it on their desk. They must then put the requested action into practice throughout the week. The name ETA is based on the acronym for "Estimated Time of Arrival" for the concept of a collective "journey". It is also a play on word referring to the French word "état", meaning a "state" of mind to be reached. The game can become a vital tool for all employers or human resources managers who are committed to the well-being of their human capital. Divided into five categories (head, body, heart, alter ego and environment), the cards require the players, for example, to use visualization, or to engage in a few minutes of introspection, or even to bring a little more life to their work environment. Was it a coincidence or simply a matter of logic given the current state of the industry? A meeting between Marie-Hélène Leblanc, Director, Brand Strategy at VIBRANT and Marie-Josée Lareau, founder and President of InnoveLab, was at the heart of this initiative. 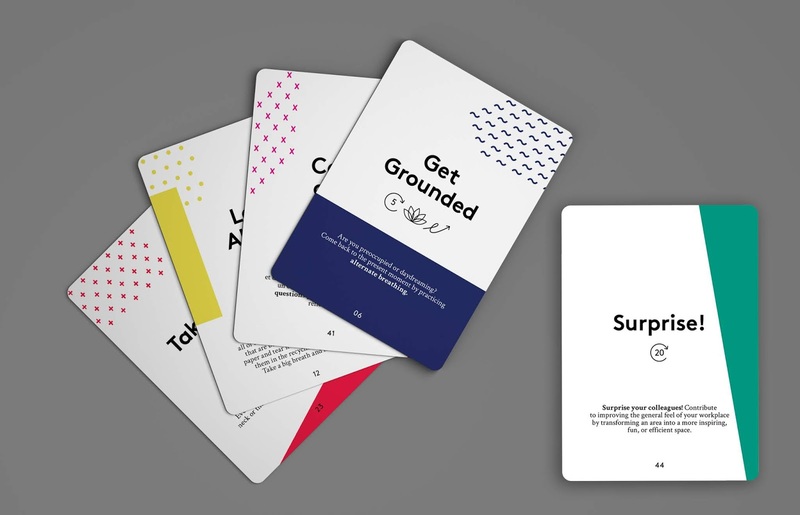 Marie-Hélène, who has worked in marketing for over 10 years, wanted to create for her team a card game that would address the urgent need to refocus on oneself and be in the moment. "Unfortunately, we never take time to assess our needs. We run from meeting to meeting, without eating or taking the time to have a glass of water, and we can't always control the need for overtime. As a minimum, everyone should take a few minutes to take a fresh look at themselves in order to regain a state of mindfulness. In recent years, we have established the VIBRANT Academy to meet this need. Our employees now benefit from a multitude of training programs that allow them to develop their potential at work. However, we always had the impression that once the workshops or sessions were over, people would quickly return to old reflexes and bad habits, hence the need for a tool that would bring to life the legacy of all these resolutions." Marie-Josée Lareau, a renowned trainer in this field for more than 20 years, says: "I have always dreamed of a card game that would bring what I teach to life. ETA then becomes the perfect solution: 52 cards to apply these best practices 52 weeks a year. It is more than just a tool: it is a gift to yourself and to your company. Like my training courses, some actions involve introspection or moving out of one's comfort zone. The most important thing is that each card is designed to collectively make tangible day-to-day improvements. I am really proud of the end result." The game will be released shortly. VIBRANT builds brands that deliver tangible results and brings together dedicated professionals to create meaningful connections between brands and people. VIBRANT creates solutions that focus on brand experience and delivers them across North America from its offices in Montreal, Toronto, Vancouver, New York, Chicago and Los Angeles. Clients include National Bank, Sleeman, Danone, Spotify and Diageo. InnoveLab creates transformational experiences and delivers powerful solutions which are out of the ordinary, bringing people back to the heart of companies. InnoveLab's mission is to make a real difference by training and supporting leaders while helping to improve CREATIVITY, INNOVATION and COLLABORATION. InnoveLab works with prestigious clients such as AbbVie, BDC, Cirque du Soleil, Novartis, Concordia, HEC Montréal and McGill University.